Small-groups, free-writes, or open-ended questions are my usual ways for starting a discussion in my classes. And while there can be value in routine, I do worry about a routine becoming a rut. With that concern in mind, I turned to Brookfield and Preskill’s superb Discussion as a Way of Teaching* and tried out one of the techniques they mention: choosing a concrete image. Go around the table and ask each student to state one concrete image/scene/event/moment from the text that stands out. No analysis is necessary – just recollections and a brief description. As each student reports, the collective images are listed on the board, thus providing a visual record of selected content from the text as a backdrop to the discussion. Usually the recall of concrete scenes prompts further recollections, and a flood of images flows from the students (Brookfield and Preskill 68; Frederick 142). I’ve now tried this technique twice with my 10th grade classes, and it has been a big success each time. Each student spoke early in class (and doing so made it easier later in class for some less outgoing students – perhaps it was easier to participate after they spoke the first time). Furthermore, we quickly got an overview of the reading in a matter of minutes: vital scenes, images, and events were all represented on the board. Close to 20 pages of reading was there, and while we had not yet begun a discussion of specific language from the text, we had a good sense of major moments and events. The picture above comes from the most recent day we did this activity. It was our first day of discussing The Journey of One Buddhist Nun, Sid Brown’s text about Maechi Wabi, a Buddhist nun in Thailand. 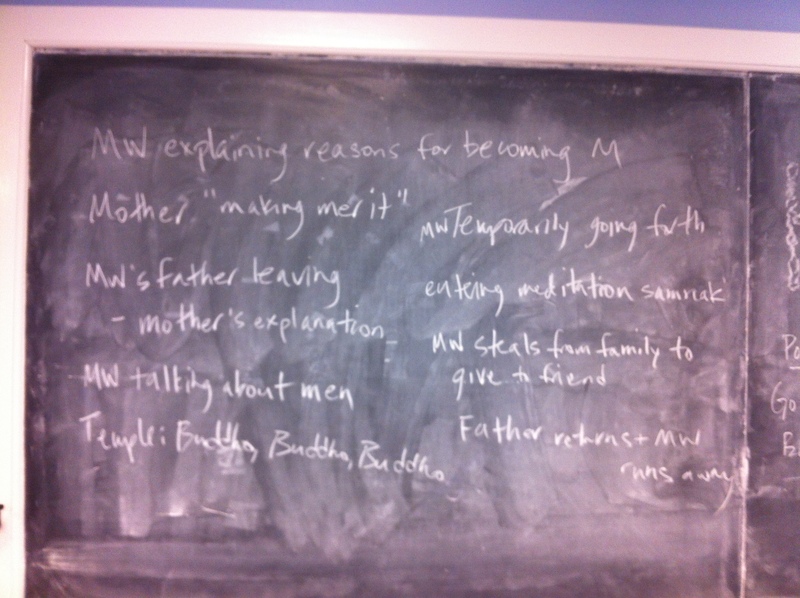 (I wrote previously about my efforts to include more female perspectives in my Asian Religions course; I’m happy with how this went in the Buddhism unit and hope to write more about it in the future.) I wasn’t quite sure how to begin the discussion, so I made a last-minute decision to try out this method. The writing on the board shows our recollections: a young woman going forward temporarily as a monastic; a young child’s first encounter with meditation; this same girl stealing food from her family to give to a friend; the mother “making merit” by cutting hair and making offerings; a father figure who left his wife twice, once to be with another woman (for five years) and a second time to try and follow in the footsteps of Siddhartha (who also left behind a wife and child). After these images were on the board, we were able to look inductively at the reading: what themes emerge? What patterns do we see? How is the life of a lay Buddhist (the mother) different from that of a monastic (the Maechis)? How do women and men practice Buddhism differently in this context? What factors, both in Buddhism and in Thai society, might contribute to these differences? I’m going to use this method more going forward. With the right reading (i.e. we don’t use it while reading Marx’s take on superstructure), it provides a way for everyone to speak in a few minutes while reminding the class of much of the reading in the same short stretch of time. The images lead to more images, and the questions lead to more questions. Definitely recommended! * Special thanks to Nate over at Whereabouts in RS Education for making me aware of this text. This entry was posted in Buddhism, Lesson Plans, Teaching and tagged Buddhism, discussion, Maechi Wabi, pedagogy, Peter Frederick, Sid Brown, Siddhartha, Stephen Brookfield, Stephen Preskill, teaching by teachingasianreligions. Bookmark the permalink. I really like this strategy and hope to try incorporating it–thanks for sharing it. After reading this article http://www.washingtonpost.com/blogs/answer-sheet/wp/2014/10/24/teacher-spends-two-days-as-a-student-and-is-shocked-at-what-she-learned/ (which has been floating around the internet quite a bit lately), I’ve been trying the questions first approach–before we start anything getting kids to lay out what was challenging or confusing as they worked through the reading. I like this because it simplifies that even further! I have a few students who I think are too nervous to even share questions–but something concrete is something they’d probably be willing to handle. I do think the visual nature of this approach can provide multiple entry points for a range of students. And while some readings are no doubt better than others, when reading a text like this one (or, say, anything from “Nine Lives” by Dalrymple) there would be plenty to talk about.